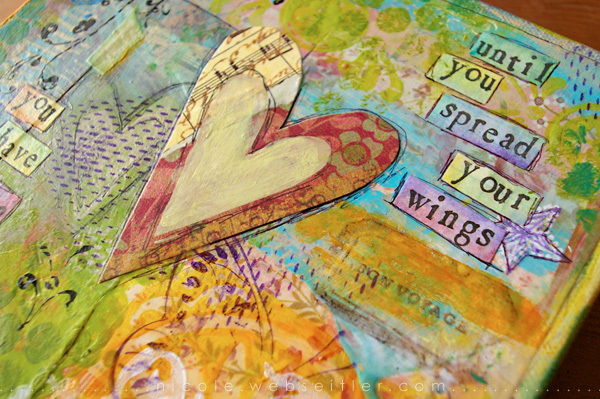 all the little stories» Blog Archive » until you spread your wings. 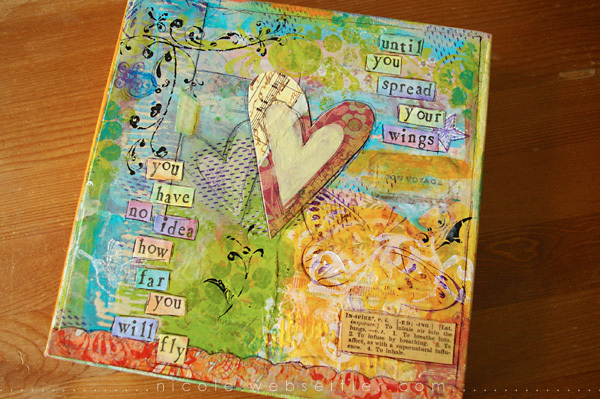 until you spread your wings. Life has been so ridiculously busy in the last two weeks—and very little of that had anything to do with the Holidays! My Christmas was actually super relaxing and mellow. But work, both freelance design projects and new things for The Digichick, kept me working non-stop into the wee hours of the morning… until we all got food poisoning, that is. Ugh! Anyway, I wanted to share my first art canvas today. I made this for my mom for Christmas. As I said in my last post, I am SUPER inspired by the amazing Christy Tomlinson. She plays a lot with canvases, so I thought I would try one myself. The quote was stamped on to graph paper and then watercolored. My mom has taught herself to paint with watercolors this year and the quote made me think of her. I made this canvas for her painting space. I loved just touching this, petting the front of it. I love to make art with my computer, but MAN—there is nothing like touching the things you make. It was so much fun to make this. When I picked up this canvas at the store, they were buy one, get one free! So, I look forward to making one for myself now… probably once I find the right quote. 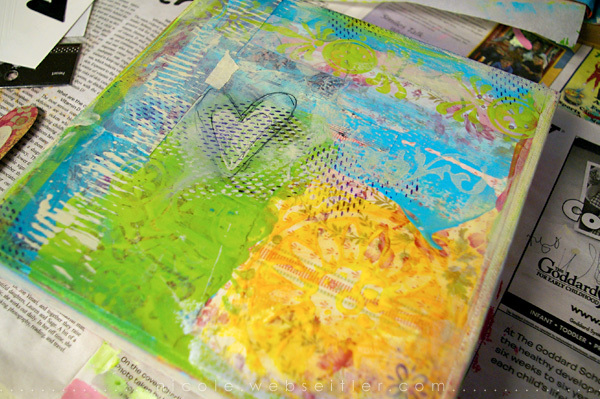 This entry was posted on Monday, January 2nd, 2012 at 11:06 pm and is filed under art journaling, arts & crafts. You can follow any responses to this entry through the RSS 2.0 feed. You can skip to the end and leave a response. Pinging is currently not allowed. This turned out gorgeous Nicole. A great quote too! SO beautiful, Nicole! Really amazing! Beautiful!! what did your Mom think of her gift? This is why I could never get myself to go digital. I love to pet the things I make. I’m a very tactile person and I have to feel what I’m working with. The texture just isn’t the same on a computer screen. 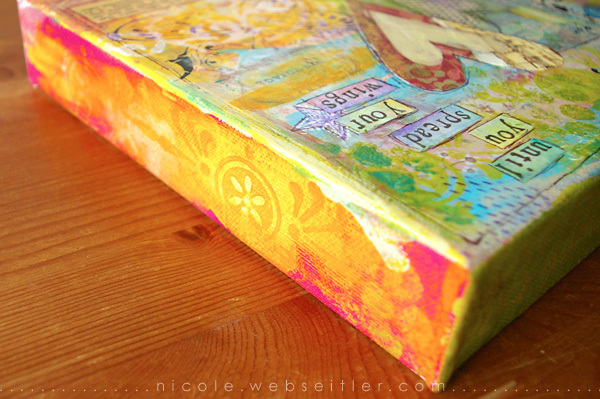 Nicole, your canvas is stunning! 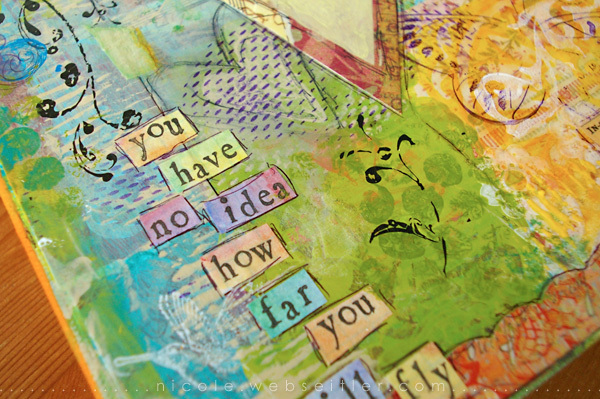 Your colours are so vibrant & the texture keeps one looking for ages! Love the quote too!